This Demonstration lets you try to find the solution to the most basic of the historic river crossing puzzles first recorded in the manuscript Propositiones ad Acuendos Juvenes, written by the eighth-century scholar Alcuin. 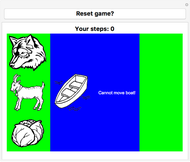 Your goal is to transport the wolf, goat, and cabbage (the passengers) across a nearly impassable river. The only way to do so is to use a boat to get from one side of the river to the other. The boat can only hold the weight of one of the three passengers, but you cannot leave the wolf with the goat or the goat with the lettuce by themselves as you move the third passenger.